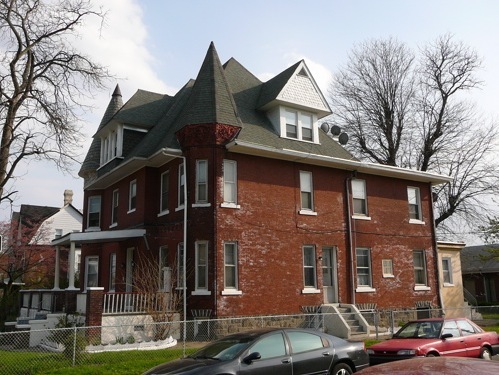 4600 Disston Street, Philadelphia PA 19135 (house: southeast corner of Ditman Street). 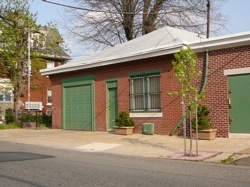 6913 Ditman Street, Philadelphia PA 19135 (laboratory: behind house). © Harry C. Silcox, Ed.D., Workshop of the World (Oliver Evans Press, 1990). The home and laboratory of Frank Shuman, an internationally known inventor, remains at 4200 Disston Street. It resembles the compounds of the inventors of the period. Here are the inventor's home, two houses for relatives and a laboratory. Here Shuman experimented with wire and safety glass, and developed a low pressure steam engine for his solar energy plant, as well as a new method of producing cement pilings for buildings. He was an officer in the first wire glass company in the United States and the president of a safety glass firm. His Simplex Concrete Piling Company, which specialized in foundations for buildings, was located at Comly Street below State Road in Wissinoming on the same site as his American Wire Glass Manufacturing Company. Shuman died in 1918 in his house on Disston Street. The compound was later divided and the buildings sold separately." 2 Shuman's house has been converted into apartments, and his laboratory is currently being used as a metal shop. 1 Ken Butti and John Perlin, A Golden Thread: 2500 Years of Solar Architecture and Technology, (Palo Alto, 1980), pp. 77-101. 2 Mrs. Marguerite Dorsey Farley lives in one of the houses; she was born in 1896 and remembers the Shuman family from her childhood. The house survives but is in poor condition. Ten electric meters at the rear suggest this house has been subdivided into many apartments. Many of the decorative items have been lost, including the corner turret, which surely rose atop the curved decorative brick cornice. The laboratory is in better condition, with freshly painted doors and millwork. It is now used by Penn Industrial Installations. A one-story brick addition has been added to the south side (farther from the house).